When examining the weather in Las Vegas is one season better than another? Is it too hot? Is it too cold? There is no wrong time to go to Las Vegas, but if you are planning on sitting by the pool and you want at least average temperature in the 70s, the best time to visit Las Vegas is between April and October. Of course, plenty of other months offer great weather too—if you're visiting from the Great White North, a 60-degree day in February might feel downright balmy! The very best time to visit Las Vegas depends on what you are going to do. If you are headed to the pool, avoid November, December, and January. If you despise the heat stay home during June, July, and August. If you want to watch hockey, you'll be there during the NHL season, and if you love college basketball, March Madness is mad in Las Vegas during, you guessed it, March. Las Vegas has an overall warm climate, with scorching summers and winters that are cool but not cold. For most people, much of their time in Las Vegas is spent indoors, gambling, shopping, or dining, but pool parties are very much a part of the Vegas experience as well. For the best pool weather, visit during early spring or fall. Temperatures in Vegas can often exceed 100 degrees Fahrenheit, but very rarely drop below 40 degrees Fahrenheit. Vegas is popular year-round, but you can expect maximum crowds around large expos and conferences, such as the Consumer Electronics Show that's held in January. School holidays and three-day weekends are also popular times when you'll see increased room rates. January is the coldest month in Vegas, but cold is a relative term: Most visitors will still find temperatures pleasant. This typically isn't a super crowded month, but double-check the conference calendar to avoid overpaying for hotel rooms. CES, the Consumer Electronics Show, is held in January each year, as is the AVN Adult Entertainment Expo. New Year's Eve on the Strip is a massive party celebrated by various nightclubs, restaurants, and hotels. February is mild and usually sunny. Las Vegas does receive about 300 days of sunshine per year, after all. While you might not be lounging by the pool, temperatures are warm enough for golf and other outdoor activities. The Las Vegas Golden Knights play at the T-Mobile Arena throughout February. Valentine's Day is a huge holiday in Las Vegas. Many restaurants and hotels offer special packages for lovebirds. March just might convince you that Las Vegas has the best weather on earth. Mild temperatures dominate the weather forecast, and every day is just about perfect. Pools are pleasant but not warm, and if you enjoy the outdoors, you will never break a sweat no matter what you are doing. St. Patrick's Day in downtown Las Vegas is a rowdy affair that includes a parade, and events are various casinos and hotels, such as Irish dancing at the Mandalay Bay Resort. The Pennzoil 400 is typically held in March. It kicks off the racing season with three days of NASCAR in Las Vegas. April in Las Vegas has great weather, but it's still one of our least favorite times to visit. Why? The crowds. April is spring break, which means that the pools, the shops, the casinos, and the restaurants are all jammed with people. The Las Vegas 51's, the city's minor league baseball team, typically kick off their season in early April. Games are held Cashman Field. March Madness, the NCAA basketball tournament, lasts well into April. Find your favorite sportsbook and make a wager! May is perfect weather for golf, with temperatures usually in the 80s Fahrenheit. This is also the month when it regularly becomes "pool weather." If you can, go early in the month before kids start getting out of school for the summer. Las Vegas Science and Technology Festival is a free event held in late April or May. 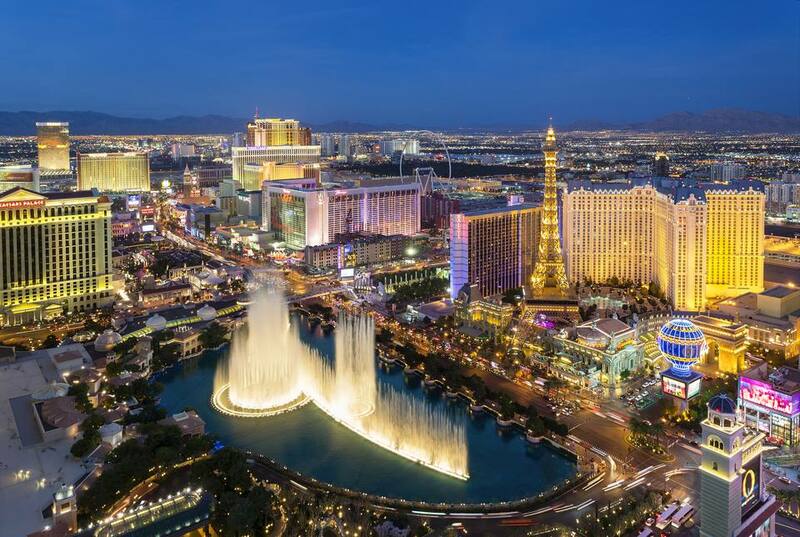 It typically offers free, behind-the-scenes access to some of Vegas's coolest sites, like the Bellagio fountains or the shark reef at Mandalay Bay. The Kentucky Derby takes place on the first Saturday in May. While the race is held at Churchill Downs in Louisville, Ky., it's a big day for gamblers in Vegas. June is full-on pool weather with averages in the low 100s Fahrenheit. However, evenings are perfect for walking along the Las Vegas strip. Crowds can be a bit higher in this month since kids are out of school. The Las Vegas Film Festival takes place in June and showcases independent filmmakers and their work. Films are presented at the Brenden Theaters at the Palms. Las Vegas Restaurant Week lets diners sample some of the city's most exquisite dining at a discount. Benefits from the prix-fixe menus support local charities. July is hot, but it's a dry heat. If you can bear it, it's a great time of year to visit: Prices are lower, and the pools have plenty of action. The World Series of Poker typically hosts its BIG One for One Drop in July. This $1 million buy-in tournament is capped at a maximum of 48 players and is poker's most charitable initiative. The Rio hotel hosts the annual StarTrek Convention, a long-running event that hosts fan and many celebrities. Temperatures are still in the triple-digits during August, but it's a great time to find a refreshing pool with shaded cabanas to hang out in. Crowds die down later in the month when kids go back to school. American Poolplayers Association typically host their National Team Championships in August in Vegas. The event is the world's largest amateur pool tournament. The Tejano Music National Convention includes dance instruction, great food, and naturally, great music. It's typically held at the Rio Hotel. If you don't have children, this is the best time to visit Las Vegas. The kids are no longer at the pool, but temperatures are perfect for long days with a drink in your hand and your body in the water. Burning Man, perhaps the most popular event in the Vegas metro, takes place throughout a few days in early September. More than 50,000 people attend. The Las Vegas Greek Food Festival has been held for more than 45 years. Held at St. John Greek Orthodox Church, admission is just a few dollars and lets you sample tons of delicious Greek cuisine. October still has some great pool days, and the weather begins to look like a Las Vegas interpretation of fall. Don't expect any significant changes unless you walk into the Bellagio Gardens. The Las Vegas Food & Wine Festival features delectable dishes from top Vegas chefs and tastings of top wines. It's typically held in early October. Art in the Park in Boulder City is a two-day festival that showcases the work of more than 300 artists. More than 100,000 visitors attend. Temperatures cool down in Vegas in the fall, so while you still can enjoy plenty of outdoor activities, most visitors to the Strip will want to spend their time indoors. Luckily, there's no shortage of events and activities to keep you busy. In early November, the T-Mobile Arena hosts the PBR National Bull Riding World Finals. This annual bull riding championship includes plenty of concerts, parties, and celebrations at venues around the city affiliated with the finals. If you like wine, don't miss Lee's Discount Liquor Wine Experience, held at the Thomas & Mack Center at UNLV. The event features more than 1,000 wines from around the world. Weather is all relative, so if you experience severe winters in your hometown, you will be so happy to find out that December weather in Las Vegas is not at all something to be too concerned with. You will still be able to walk around outside, and you can be sure that your snow boots will not have to travel with you. The Las Vegas Marathon is held in December to take advantage of the month's cooler temperatures. The holiday lights and Christmas tree at the Fremont Street Experience is a great way to get into the mood of the season.